This beautiful Rose Gold 'My Angel' Heart Charm is a fabulous new addition to the popular stainless steel composable collection, and features a 9K rose gold embellishment. 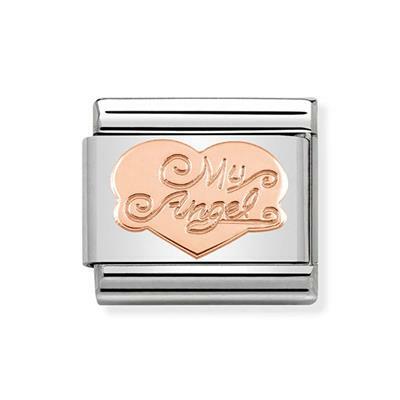 This classic charm with a heart motif, engraved with the words 'My Angel', is a sweet addition to Nomination's new Christmas collection, and makes for a perfect romantic gift over the holiday season. Will fit any classic sized Nomination bracelet.